Here’s what I’ve been up to over the last 30 days. It’s been highly productive, even though what I have achieved was not quite in line with what I had set out to do. It’s always interesting for me to see how unpredictable creativity is. Now you can listen to my ramblings wherever you go. There appears to be an issue with the iTunes feed at the moment, I’ll add the link as soon as Apple figure out what’s wrong with their servers. If I find other podcasting related things to say, you’ll be able to find it in my Podcasting Playlist. On this occasion, I decided to try out a new YouTube feature called Premieres. It’s a clever mechanism whereby the videos are shown “live” for the first time at a scheduled time. Facebook have a similar feature, and I’m not sure sure who copied it from whom. The idea is that fans and creators can join a live chat before and during the premiere so any questions can be answered. It was an interesting experience, I may do this again in the future. It’s a “sort of” live stream, something I’ve often contemplated doing, but as it often is with complicated 3D software, things can get boring really quickly when humans have to wait for machines (I’m thinking render times, crashes, things not working, etc). Editing those boring bits out makes for a much more pleasing viewing experience. Julia and I took some time off to visit friends in Ohio for Thanksgiving, something we’ve bee meaning to do for several years. Our plans were rather rudely interrupted by my cancer shenanigans, so being able to travel the distance from Miami Beach to Columbus, and from there to Rochester, Buffalo and Canada was a great testament to my wellbeing. I wasn’t sure how my whole body would react to long car and plane journeys, but I’m very pleased to say that I held up well indeed. I’ve made several videos to remember the trip by, one of which is some stunning footage of the Niagara Falls on the Canadian side. Another one was of a trip to the George Eastman museum in Rochester, the man best known for founding Kodak. I haven’t had a chance to edit the footage yet, so I’ll let you know when it’s up (probably next month). On Thanksgiving, I felt like writing an article for the Super Survivor website about some interesting experiences I’ve made in regards to food. It goes hand in hand with a nice discovery about self awareness, exactly the kind of thing that would have made it into my book if I was still writing it. That’s what the Super Survivor website is for: to continue that process as a long-term observational note pad. Check out the article here if you’re interested. There’s more footage of what I’ve been up to over on my other channel, specifically in the November 2018 and Ohio 2018 playlists respectively. I’ve filmed a two-person interview with my friend Mikahil while I was in Ohio, in preparation for a microphone review I’ve promised to do. This was a nice test with my two GoPro cameras and a new dual-head lapel microphone. All it needs now is a quick introduction to the product and some editing and then I can share it with you, probably in December. From time to time I provide feedback and make suggestions on how to improve software products that use every day. Adobe and Apple usually don’t care, so I’ve given up sending them suggestions. The Techsmith Team however are nice enough to at least consider what I have to say. Maybe I’m lucky enough to reap the benefits sometime in the future. There’s always stuff to do on websites. Things stop working, things need to be added, and it’s a time consuming process. Sometimes I find it enjoyable, sometimes I don’t. Thankfully, this month I had fun doing it – even though it was a lot more than I had intended to do. Here’s a quick run down. I’ve added small tweaks and updated the information on my main front page at versluis.com. This includes a preview to my book, a prominent link to my second YouTube channel and a link to my Patreon page. 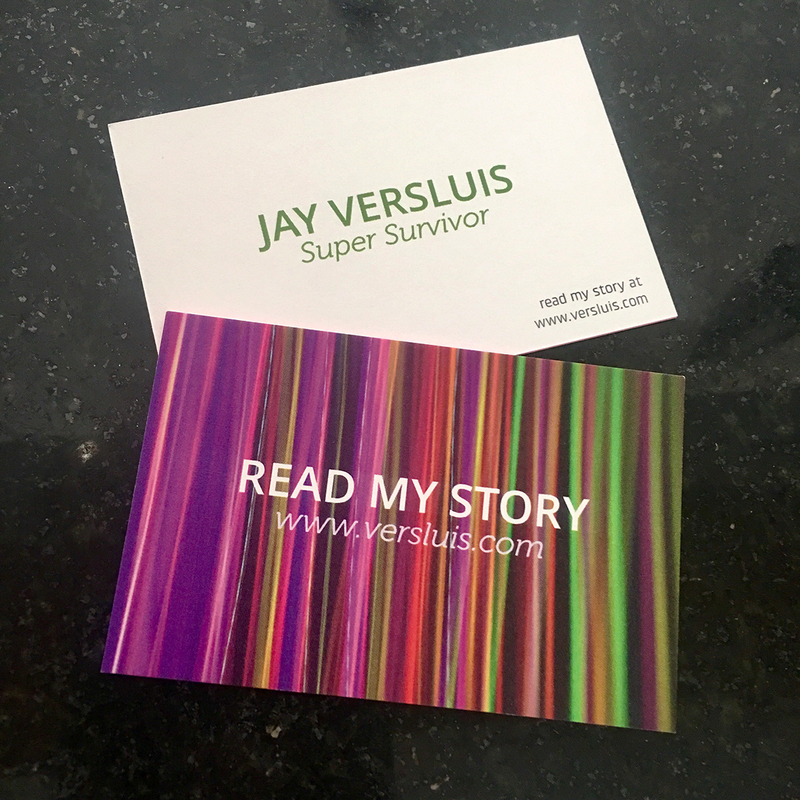 I did this in response to some feedback I got from people who received a business card from me, promising they could read my story and find out more about who I am. Most of them only look at the front page and are confused by the lack of clear information – and quite rightly so. I felt that needed to change. On this occasion, I’ve updated two menu items on versluis.com and wpguru.co.uk to showcase my many Podcast Feeds. The content on both pages is identical, with links to all my current podcast feeds at various services (otherwise, who would ever find any of those). I’m not entirely happy with the layout of that page, but at least it’s a start. Speaking of tweaks, the regular JetPack Titter widget has stopped working for some reason, so all I had in my sidebar was an error message. I had fixed this issue with the Rotating Tweets widget on my other websites, but had forgotten to implement this on wpguru.co.uk up until now – so that’s fixed. 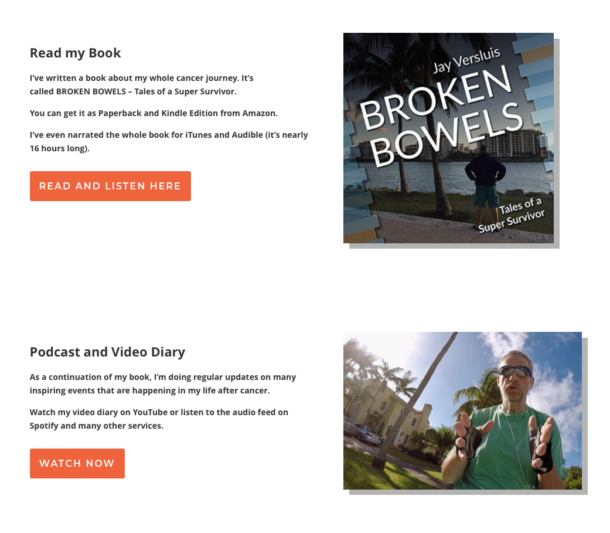 I’ve added the Super Survivor podcast feed and my other YouTube channel to the front page of my supersurvivor.tv website. I’ve been promising my readers excerpts from my video diary for a while now, but there was simply nothing to see. My diary since October is a good start, and over time my plan is to add older entires to the feed if and when I feel the time is right. I’m also mentioning the audio version of the book and changed the graphic to the square cover. The site is using the Divi Framework by Elegant Themes, a rather complex beast with excellent front-page editing capabilities I had to re-learn on this occasion. Perhaps I should record a few Divi videos while it’s fresh in my memory. To link up the new button properly, I needed a new landing page to showcase both the embedded audio playlist from Spotify, as well as my latest videos as thumbnails. I wanted this page to auto-update every time I post new content on those feeds, and thankfully I’ve managed to do that: the Spotify feed works with oEmbed, so all I had to do was paste the URL into the WordPress page. That alone created the swishy player on the page. The same principle works for single YouTube videos too, but not for a whole channel. To make that look palatable, I’ve used a plugin called YouTube Embed Plus. It was a tad tricky to setup because it needed a Google API key (and getting that wasn’t straightforward) – but once in place, I could specify my channel’s URL, a gallery layout and boom. 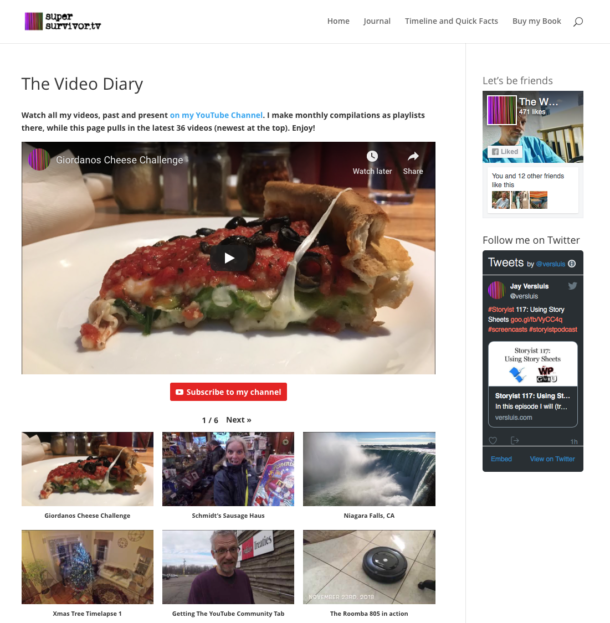 It even has a subscribe button, and the latest video is shown in full-width at the top. It’s magic! I liked it so much that I’ve added it to a new page on wpguru.co.uk as well, showcasing my latest videos from my main channel. I’m always amazed when I look at the amount of stuff I’ve spent time with at the end of a month. I would forget most of these things if I wouldn’t write them down. Can you imagine what my output would be like if I had more time to do these things? Or even some assistance? Or even… a strategy? I have several ideas for DAZ Studio related videos, and I’m looking into which topics to pick. On my long list are some Iray topics (Denoiser, Canvases, Tonemapping), and some general usage tips like D-Formers.